Common Wrongly used English phrases. English is a tricky language, even people who speak fluent English make some very common mistakes in English. In today’s English speaking lesson with your teacher Rachna, you would learn about such common wrongly used English phrases, which dumps your reputation as an English speaker. These mistakes in English are made unknowingly without the speaker being aware of them. Look at these common errors in English and stop making them. Watch our other free Spoken English lessons to improve your English and speak fluent English confidently. 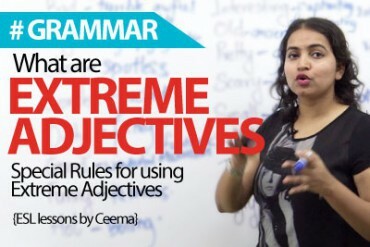 Hi friends, I’m Rachna and I’m back with another interesting lesson. So if I ask you, who is the nicest actor in the world or should I ask you who is the nicest actor in the world? So is it nicest or most nicest? Well, according to me it is nicest but I don’t know why a lot of people say, the most nicest and this is what today’s lesson is about, wrongly used English phrases. So people use common phrases or you know phrases that you use on a daily basis incorrectly. Yeah, and it is important to use English phrases correctly especially those that you use on a daily basis, right. So let’s take a look at the first one. Return back, revert back and reply back. Now often I receive emails from my clients stating that I will revert back in the next three days or a lot of people say if I ask a friend of mine, when are you returning from your holiday? She says I’m returning back on the 2nd. So returning back, reverting back, replying back, okay I’ll reply back later. Now, friends, I need to tell you something. That words like return, revert and reply already have the essence of back. So when you say revert it means you are going to answer, okay. You’re going to return with an answer. So you needn’t use back. Now, this is the most common error people make. So remember when you use these words that already have the essence of back, do not use reply back. Do not use revert back, do not use return back. Just use the word without back. Okay, so that’s the first common mistake people make. The second one is most essential. Now the word essential is an adjective, okay. Now, this adjective means something that’s basic, like food, clothing and shelter are essential needs of a human being but you don’t say most essential. So remember when you use the word, essential, it stands alone. You need not use qualifiers like much, more or most. Okay so avoid using this, essential is an adjective that stands alone and it means basic. So you needn’t use any qualifiers. The next one is the most happiest. That’s what I said at the start of the lesson. So should we say the most nicest actor or the nicest actor? Now I’m going to tell you why do we use only nicest. Now happy is an adjective. It describes a state of feeling good or being in a good state. Happy is the positive form, comparative is happier and the superlative is the happiest. That means it’s the highest form of the adjective. So if I say, I’m the happiest lady in the world that means there is no one who is happier than I am, right? So it is already in the superlative, okay. You do not use most. So we have who’s the nicest actor? And the happiest lady in the world. Now you may be wondering that we do use most with some adjectives in the superlative degree. Yes, friends, we do but that is only when the adjective does not run into a comparative or a superlative degree. I’ll give you an example, I can say, Sandra is the prettiest girl in the class. I needn’t say most prettiest because it’s already in the superlative. You have pretty, prettier, prettiest. Now if I want to use the adjective beautiful, we do not use beautiful, beautifuler and beautifulest because it does not change its form. So what we do is we take help of most. So you have beautiful, more beautiful, most beautiful. So when an adjective is stubborn and it does not change, you add more and most to change its form in the comparative and superlative respectively. So remember, this has already gone in the superlative. You do not add most. Okay, I’ll give you another example, so if I ask you if you’re unwell and if I ask you, how do you feel? You say, I’m better today but people say, I’m much better today but you’re better right from good to better. So do not add these qualifiers. They only come when the adjective does not change its form. Well, the next one is got off scotch free. Okay so it’s not scotch, scotch is alcohol. It is scot-free. Okay so if you get off scot-free, it means that you’ve done something wrong and you have escaped without paying a price and it’s like you know you got away with blue murder. That kind of a thing. So imagine if you have not met your deadline and you’ve still got leave and you’ve got to go on your vacation that means you have got off not scotch free but scot-free. Okay, so you’ve escaped without paying a price. So a lot of people use scotch free. It is not scotch free, remember and scotch is never free. That is one thing but get off scot-free. Fine, so the word is scot and not scotch. Let’s see the next common phrase, wrongly used phrase, hair are long. Now hair, so I have a lot of hair. Okay, remember that and not hairs. So there is one mistake that people use is hairs. So that’s not hairs. Okay, it is treated as a non-countable noun. So you always use it with a singular verb. Hair is long. Okay if you want to talk about someone’s hair texture, you do not say hair are soft. You say, her hair is soft. So remember friends, the trick is, treat hair as a single entity, followed by a singular verb, right. The next one is, first come first serve. So I call up this cafe to book a table for dinner and they say that, they do not take bookings. They do not reserve tables because their policy is first come first serve. I mean well the mistake here is, first come first served. Okay, that means if you go there by 8, you will be served before a person who walks in at 8.30. So it’s like, first come, first served. So a lot of places if you have noticed, it is written, first come, first served which is absolutely wrong. It is served. Alright, so we have first come first served, don’t forget the d, first served policy, right. The next one and the most common one is, give an exam. Now friends, you never give an exam, you take an exam. Okay, your examiner gives you the exam and you take an exam. So a very common, a very common mistake people make when they talk about examinations. So if you’re in say, you are graduating, you say I’m taking my exam and not giving my exam. So remember you do not give. Now, this is one of the most wrongly phrases that I have come across and I don’t know why people use it this way but remember you take an exam and not give an exam. so you use this expression correctly, you may have people looking at you very awkwardly and weirdly, trying to understand what you’re saying but trust me, you’re on the right track when you say, I’m taking an exam. The next one is try and do it. Okay so try and do it. You don’t try and do it, you try to do something. So okay if your friend asks you for a favour and you really want to help her but you want to tell her that you will make an attempt to, what generally people say is, I’ll try and do it for you. So no, you do not say, I’ll try and do it, I’ll try to do it for you. Okay, so there is no and. remember you try to do something and not try and do something right and the last one is on the other hand. Well, this phrase is not wrong but remember it has to be used with on one hand. Now I’ll give you an example if my friend keeps cribbing about her job and says she has a lot of work okay and she keeps getting a lot of work. So she tells me that I’ve got a lot of work and I’ve taken on a new project. So I’m gonna tell her, on one hand, okay. On one hand you are complaining about having a lot of work and on the other hand, you have taken more work. So my point is you have to use, on one hand, okay then your sentence followed by on the other hand. I cannot tell her, you are complaining you have a lot of work and on the other hand, you’ve taken more work. No, I have to use on one hand in the first part of the sentence and on the other hand in the second part. So they complement each other, they come together. So a lot of people just casually put, on the other hand in any part of the sentence which is not correct. So, remember you can use it, once you use on one hand followed by whatever on the other hand. Okay friends, so these are the basic wrongly used English phrases and these are common phrases that we use in our daily spoken English. So remember, I’m sure now you can go ahead and use them correctly. I hope you enjoyed watching this lesson. I’ll be back soon with a new lesson, till then take care and bye. 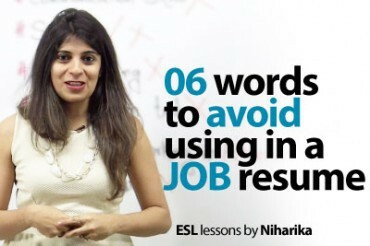 06 Words to avoid in a job resume.